There are 59 candidates running across the three constituencies. IN LESS THAN six weeks Irish voters will go to the polls to have their say in European Parliament elections. 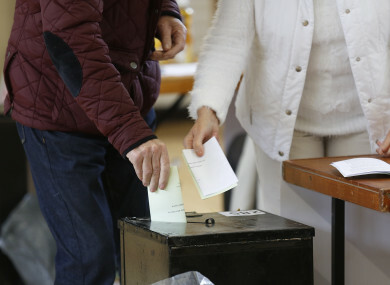 The deadline for candidates who wanted to run in the elections closed at noon yesterday and there are now 59 candidates vying for the 13 Irish seats in three constituencies. There were some last minute additions to the list such as Independents4Change TDs Clare Daly and Mick Wallace, as well as campaigner Gemma O’Doherty. This area covers Dublin city and county and there are four seats available. In this consituency there are four seats available and it comprises Cavan, Donegal, Galway, Kildare, Leitrim, Longford, Louth, Mayo, Meath, Monaghan, Roscommon, Sligo and Westmeath. There are five seats in this constituency which covers Carlow, Clare, Cork, Kerry, Kilkenny, Laois, Limerick, Offaly, Tipperary, Waterford, Wexford and Wicklow. If any of the seven TDs are elected to the European Parliament, there will have to be a Dáil by-election within six months to fill their seats. Two of the elected MEPs will not take up their seats immediately if Britain participates in the elections. Voting takes place on 24 May and the register can be checked here. Email “Here are the candidates running in the European Parliament elections ”. Feedback on “Here are the candidates running in the European Parliament elections ”.